Seefeld became famous for cross-country skiing because it was the site for the Nordic events during the Winter Olympics in the 60s and 70s. Since then it has frequently been the venue for top-level competitions and is known amongst insiders as one of the top resorts for cross-country skiing. The many awards that have been presented to the Olympiaregion Seefeld in the last years pay tribute to the excellent conditions of the cross-country ski trails. But it's not just suitable for racers - the ski school has its own cross-country section with a high reputation and the trails around the town are perfect for beginners to learn on. For us it doesn't matter if you have been enjoying the sport for many years or if you just want to try it out for one day. 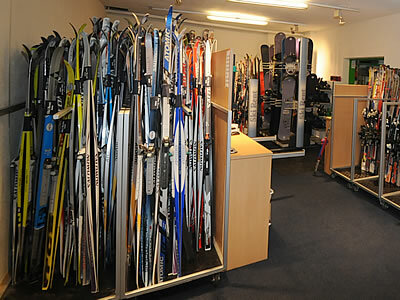 At Ski Rent you've found the right spot for equipment hire and advice. Ask us what you want and we'll try our best to help. Experienced skiers can take advantage of some of our high-level cross-country sets - either traditional or skating. Families can take off into the surrounding countryside together with our range of children's cross-country equipment. And some of the best tracks start just down at the end of the road from our shop!